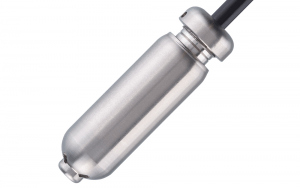 A hydrostatic level sensor is a submersible or externally mounted pressure sensor that determines level by measuring pressure above it, which increases with depth. From this measurement, together with knowledge of the liquid’s density / specific gravity, it is possible calculate the liquid level above the sensor in the vessel. Temperature compensation will take into account changes in specific gravity due to variations in temperature.